Our tour unfortunately had a very bumpy ride. The Hypergrid and Opensim were not behaving at the start of our meeting, and due to bandwidth/hardware limitations on PMgrid it was very hard for a large number of us to visit Romenna at the same time. Many of us (including myself) got bumped out and scattered across the Hypergrid. So for this report I’ll forgo the usual chat transcript. I went back to visit Romenna on my own after things settled down. You can follow my footsteps by using the directions in the notecard at the end of this blog post. I strongly encourage you to make this journey yourself. And I promise you will not be disappointed by what you find at the end. I began my solo adventure on the region Pathlandia on jokaydiaGRID. Well, I wasn’t completely alone. I had my trusty donkey. I walked through an instant hypergate (aka “Blamgate”) on the region Pathlandia. And I arrived on the region HG Gateway 1 on ReactionGrid. 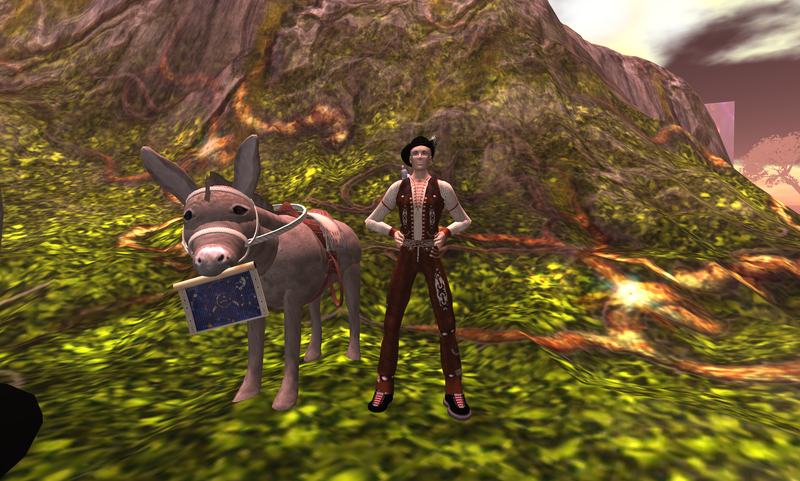 And yes, my donkey decided to stay behind on Pathlandia. He can be stubborn that way. I then made a manual hypergrid jump to the region Art00 on PMgrid. Not much to see here. But this was just the Hypergrid arrival point for PMgrid. My final destination was Romenna. So I made a local teleport to the region Rom20. I arrived on the docks of Romenna. Before me sprawled a dense city covering 9 full regions, with surrounding forests and a small village covering an additional 7 regions. The entire build was consistently themed and fit together like a picture perfect fantasy with many walkable streets and detailed buildings to explore. 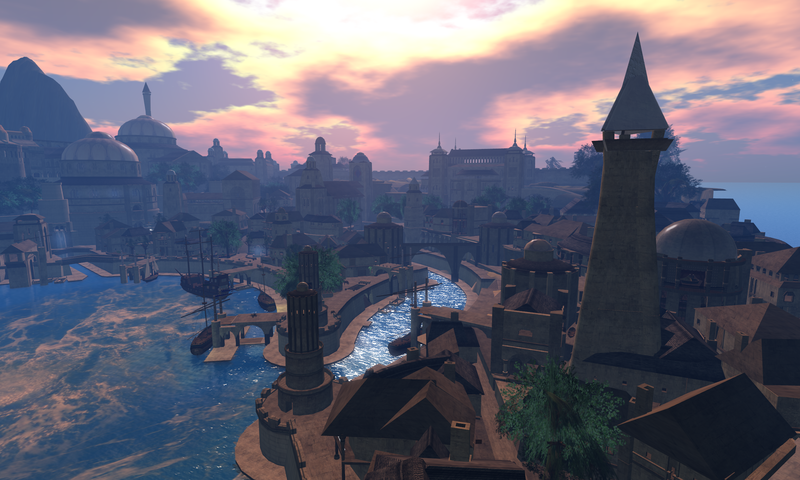 I’ve visited many wonderful virtual cities over the years. But this one took my breath away with its broad vista, realistic layout and artistic beauty. Don’t take my word for it. Just look at it. What’s also amazing is the fact that PMgrid is run on very low grade hardware behind an ordinary domestic broadband connection. The owners of PMgrid, Bob Wellman and Peetr Maynard, run it as a labor of love. And they freely share space on their grid as a way to cultivate projects like Romenna. Bob, Peetr and Nick, thank you for all your hard work. If you’d like to find your way to Romenna, please follow the instructions in this notecard. And see if you can find the hidden underground sewer system! Our final destination is “Romenna,” a beautifully detailed city and countryside area comprised of 16 regions and built by Nick Lassard. 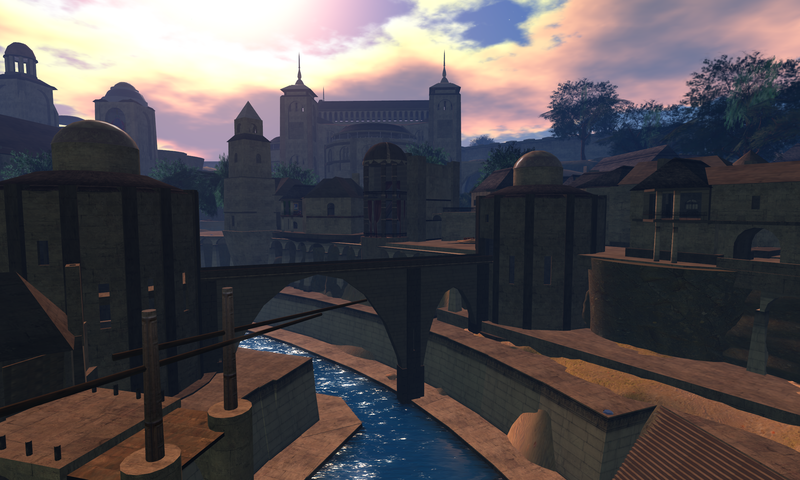 A few years back, Nick had a 4 sim area called “Osgiliath” in Second Life. Osgiliath was shut down due to financial reasons, but Nick decided to build it anew (and much bigger!) as “Romenna” in Opensim. This entry was posted in Hypergrid Adventurers Club, OpenSim, Virtual Worlds and tagged avatars, HyperGate, HyperGrid, Hypergrid Adventurers Club, jokaydiagrid, metaverse, Nick Lassard, online communities, OpenSim, PMgrid, ReactionGrid, Romenna, virtual worlds by John "Pathfinder" Lester. Bookmark the permalink. thanks for showing me this place. it is all you say it is. Now I must try to visit this beautiful place! so glad you posted all this information and amazing pictures of this build. Thank you! I also gave up during the initial trip but went back later. I was completely bowled over by it – one of the most beautiful builds I’ve seen anywhere. I managed to fall down into the sewers and had to leave but I plan to go back to explore still further. Thanks for taking me there. Looks lovely! Looks like a great setting for a role playing game or a social group. 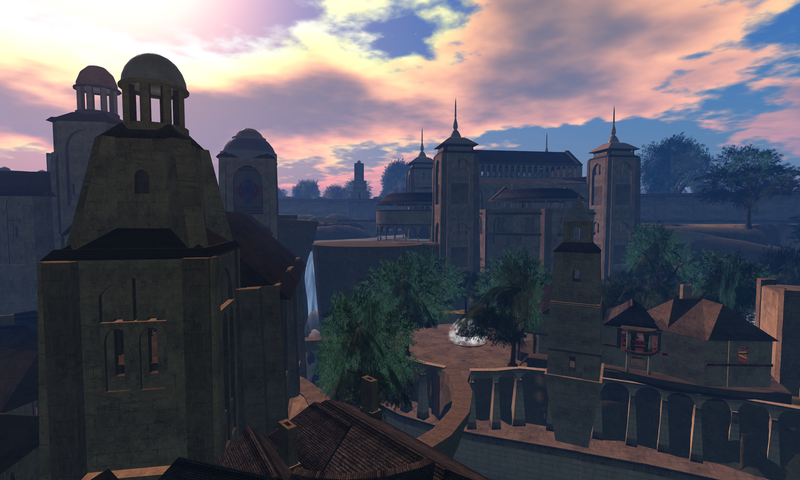 Maybe someone could license the build or a version of it for that purpose — one great thing about OpenSim is that you can simply download an entire region and then sell it or give it away to people as an OAR file. Yet another bump in the road trying to understand learn about open sims/grids etc. (sorry if I sound frustrated, but my attempts to access and enjoy OS regions over the last two weeks have been exercises in futility. My avatar looks horrible, everything crashes, websites with directions are not complete, finding information is like hunting a needle in a haystack). If you want users to transition, something needs to improve! Sorry to hear you had problems. Once you made it to “HG Gateway 1,” you tried searching for “julpet.ath.cx:9020” on the world map? If you didn’t find it, maybe it was temporarily down? I just tried it and reached it ok.
As for crashing, which viewer are you using? And I agree, more information needs to be out there for folks to easily follow. 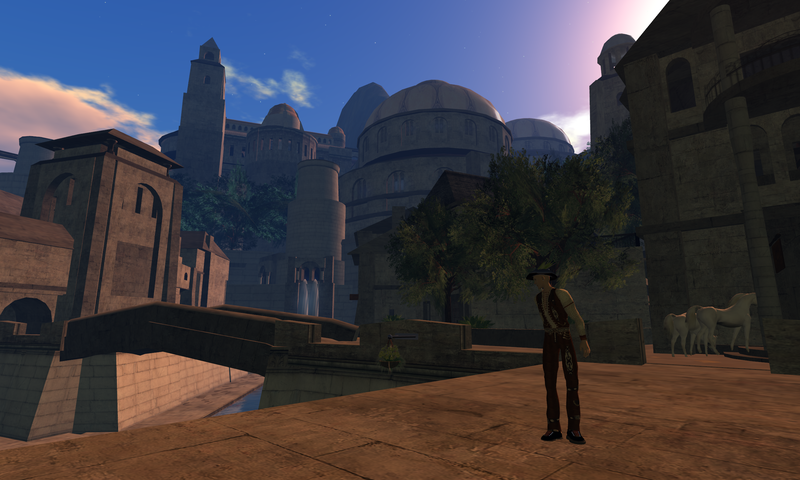 I try to do my part by blogging about the trips we make with the Hypergrid Adventurers Club. I hope my tour reports give people not only useful information about hypergrid jumping but also an opportunity to put theory into practice by actually taking a trip somewhere interesting. Thanks for the reply back Pathfinder. At home I used Pheonix. I am now at my office trying with Imprudence. It worked this time, however when I teleported to “Rom20” I ended up under the sim build with no way to get out. I picked another sim nearby and was able to end up above ground. So my ugly avatar walked around for 10 minutes before it crashed. The sim is very nicely done, and well worth a trip. When I get home tonight I’ll try again with Pheonix. Full disclosure: I went back to the screen after writing the reply, and indeed I had not crashed. I was just frozen in place for about 5 minutes. I’m glad you were able to get there eventually. I find it’s best to try out different viewers. Depending on your computer’s specs, some viewers may be significantly more stable than others. Personally, I find Imprudence works best for me when exploring the Hypergrid. But everyone’s different. 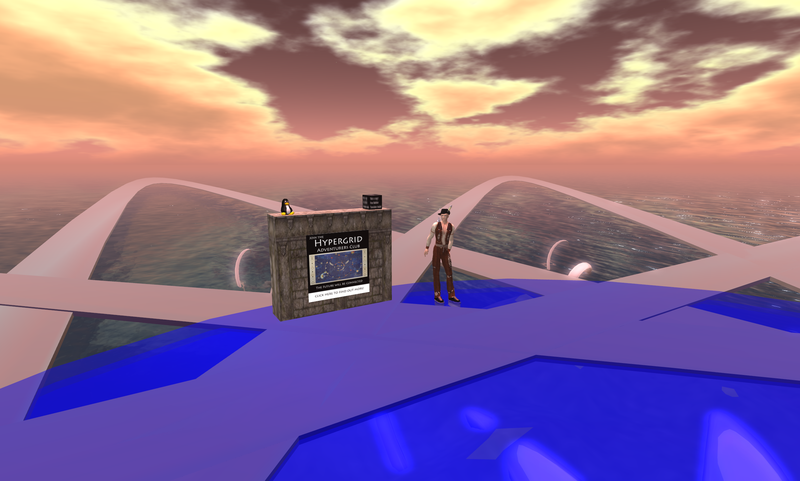 Have you explored any avatar freebie stores on the hypergrid to upgrade your avatar’s appearance? Thanks for the Imprudence tip. 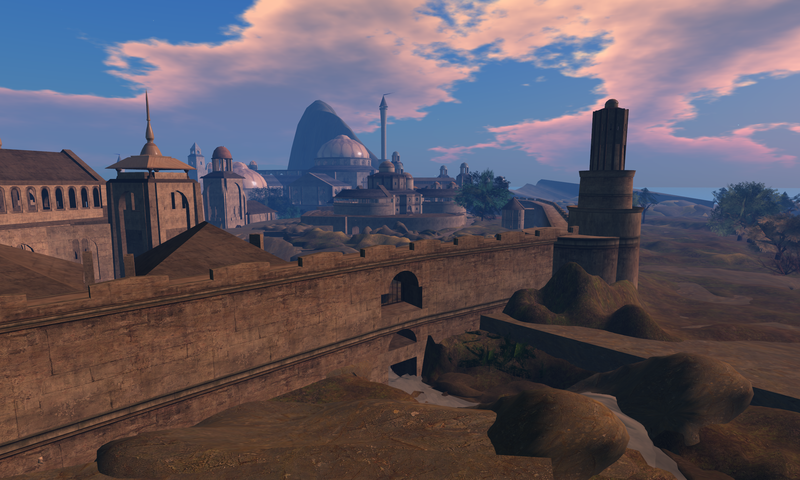 I was at the Jokaydia Grid freebie store – any tips on location of others would be welcome! Thank you for the kind words folks, but I’ve decided to close Romenna due to lack of interest. Maybe in a few years it will come back in a better form. Disregard the former comment…Romenna is still operating on PM Grid. 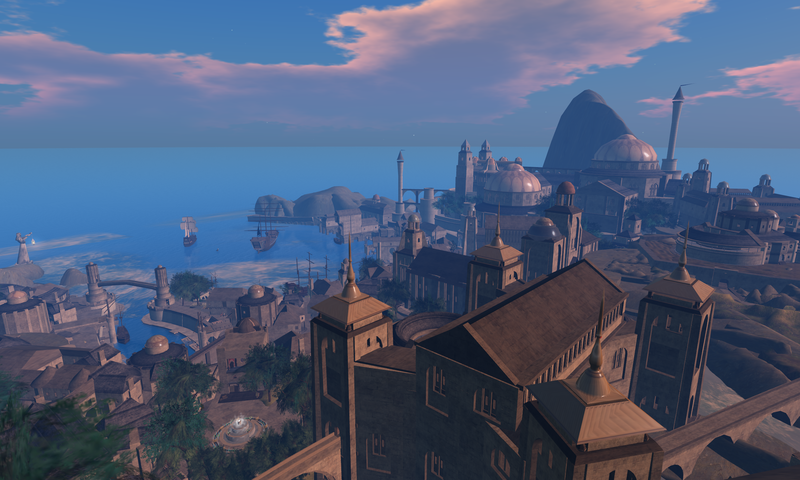 PM Grid is Hypergrid accessible. Due to the large number of big prims, it is possible to end up under one or the city. Try TPing into the harbor then fly up. Romenna is still around on PM Grid and HG accessible. The bandwidth of PMGrid has been increased along with stability from newer versions of OS. Oh cool! Thanks for the news! I’ll definitely go back and revisit it soon.